In ninth pAsuram, parAnkuSa nAyaki says “There is no use of my body which is not liked by emperumAn who is meditating upon the ways to uplift all beings as he eliminated the many shoulders of the enemy of his devotees, bANAsura, and reclined on thiruvananthAzhwAn (AdhiSEshan)”. Subsequently, parAnkuSa nAyaki says “What is the use of my body which is not liked by krishNa who eliminated the hands of bANAsura who is an enemy of his devotees?”. Ninth pAsuram. parAnkuSa nAyaki says “What is the use of my body which is not liked by krishNa who eliminated the hands of bANAsura who is an enemy of his devotees, and who contemplates the means to uplift everyone?”. kaNNan emperumAn severed the shoulders of bANAsura who has no shortcoming in his valour, bravery etc and is having the fame of being the father of ushA who is having enjoyable femininity, who is having wide distinguished waist region and is having shrinkages in her perfectly beautiful clothes; [such emperumAn, after fulfilling the purpose of his avathAram] reclined on the ancient serpent bed, pretending to sleep and contemplates the means to give shelter in the goodness (of attaining him) for all worlds; what is use of my body which is not liked by such emperumAn? yOgu – upAyam (means). mEgalaiyAl kuRaivillA – vangip puraththu nambi [a disciple of bhagavadh rAmAnuja] said “ushA’s dress makes her look very beautiful”. melivuRRa – Having a tender nature. One cannot bear the loneliness during separation [from perumAL]”. agal algul – having wide waist. bOga magaL – Girl who is qualified to be enjoyed. pugazhth thandhai – bANAsura, who is famous to be known as the father of ushA. Or he is famous for his valour, bravery etc. viRal vANan – majestic/prideful bANAsura. While one should have his sathva guNam (mode of goodness) prominently visible in the presence of a dhEvathA (emperumAn), even that time, itching to fight, bANAsura is quite prideful that he was seeking for a matching enemy for him – he is such a majestic person. buyam thuNiththu – emperumAn eliminated his hands thinking that he has crossed all the boundaries. 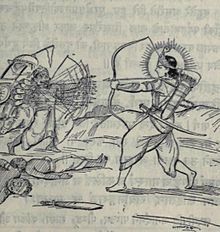 Even though bANAsuram has committed enough mistakes and deserved to have his head cut off, krishNa did not kill him thinking that “ushA cannot become fatherless”. nAgam … – Only after eliminating the very many hands of bANAsura, emperumAn reclined or enjoyed. Why is it said “thuyilvAnpOl” (pretending to be sleeping)? Is he not really sleeping? ulagellAm nangodunga yOgaNaivAn – After intending to eliminate others like bANAsura who could oppose him, emperumAn will remain in yOga nidhrA (meditation) thinking “What is the means for these worldly people to reach me by being surrendered to me?”. kavarAdha – While emperumAn cares for everyone else but me, what will I do with my body? Her body is meant for him. She also likes her own body because it belongs to him. Just as emperumAn himself remains as said in jithanthE sthOthram “bhakthAnAm” (my forms etc are for the sake of my devotees), her body is meant for the lord. This entry was posted in thiruvAimozhi, thiruvAimozhi 4th centum on April 7, 2017 by Sarathy Thothathri.